I don’t know if it was self-deprecating intent or irony that saw the creators of this franchise make a film about a bunch of half-formed dead monsters dredging themselves up from the bottom of the sea. 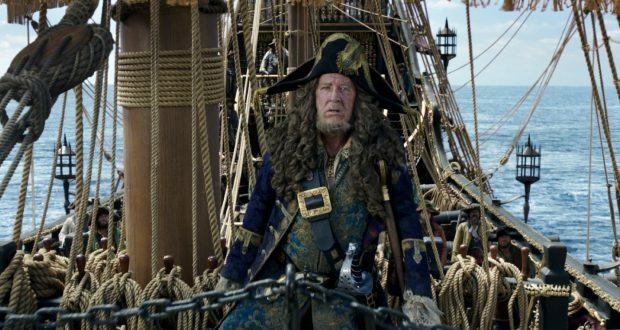 Pirates of the Caribbean: Salazar’s Revenge (or, in other regions, Pirates of the Caribbean: Dead Men Tell No Tales) is, like so many sequels and reboots we did not ask for, a mess and an unnecessary mess at that. In the tradition of the worst entries in this franchise, Salazar’s Revenge is nonsensical, overlong, and expects Johnny Depp’s now-hackneyed turn as Jack Sparrow to make up for an army of bland characters. Before anything else is said though, I must continue my war on poor cinematic editing. Was there some sort of plague in Hollywood? Were all the professional editors killed by a serial killer in the early 2000s? For reasons that quite escape me, major blockbusters are incapable of stringing together an action set-piece and sometimes struggle even with small dialogue scenes. Relative position and sequence of events become incomprehensible as cuts come more or less randomly. At points in this film, ships in pursuit close distance from the horizon to broadsides almost immediately. Even the space between characters in simple shot-reverse-shot conversation is inconsistent. It is worth saying too that given the plot of this film is ‘get the new magical item’, the writers botched it magnificently. Entire factions – let alone characters – are included who have no reason to be there and ultimately add nothing to the story. Coincidence and random circumstance carry through this thinnest of stories. The writers have also made the mistake of thinking that anyone is still invested in the baffling lore of this franchise. 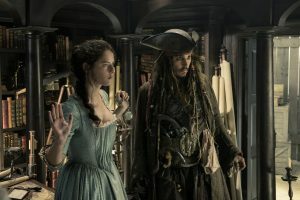 There’s a very high bar for entry in that you have to remember what happened to Will Turner and Elizabeth Swan at the end of the third film, the fate of the Black Pearl in the ignominious fourth film, and a whole host of allusions to previous magical MacGuffins, curses and bargains. Overall, the major crippling element of the story is that none of the people scrambling for the Trident of Poseidon (I know…) have goals we can sympathise with. Most of them have no ability to advance the plot. The only character who strives at all to wrap up this tangled mess is Kaya Scodelario’s Carina Smith – our new Kiera Knightley replacement – who has the singular ability to read an arbitrarily unreadable map which leads directly to the finale. Compared to all other cast members, Scodelario seems to be trying to salvage this enterprise: this is a big turn for her and she is the closest thing the film has to a functioning protagonist. Sadly, the writers – I kid you not – forgot to give her any motivation to seek the MacGuffin and attempt to make her an ahead-of-her-time feminist role model in the Emma Watson vein. This is undercut when her character ultimately gets defined by her importance to two other male main characters and loses all agency once she’s pointed everyone to the end of the film. Still, she wastes our time less than every other character on screen. On the point of characters who did not need to be in this, I think we really need to talk about Jack Sparrow. Bad enough that the character is now an assemblage of quirks and affectations, but it is clear that Depp is now a hindrance to this franchise. The amount of time spent working him into the plot is unreasonable. The first act of Salazar’s Revenge is an elaborate contrivance to introduce Jack to Henry Turner (who needs to find Jack because…? ), get him wrapped up with Carina’s quest (she should be the sole protagonist), incur the wrath of the British Empire (this is not followed up on), and coincidentally have him hunted by an army of Spanish sea zombies. There’s no need to go to these lengths to include the series’ grubby little mascot and his charm has long since worn thin. I’ve seen this slurred, cocky and addled act before. The joke ran thin four films ago. There’s little cause getting in a huff about this though. As much as one tries to see these things with an open mind, you can hardly not have your expectations tempered by the last few outings of this shambling corpse of a film franchise. Not as though it sprouted from a font of artistic ambition. We can all go to bed safe in the knowledge that this isn’t even really a film but a PR exercise as Johnny Depp tries to rehabilitate his public reputation after all the accusations of domestic abuse and marital misconduct. Keep trying there, Johnny! Verdict: This film doesn’t even deserve a bad pirate pun.